That’s what my professor told me after I announced that CAT was one of the five places I would be interviewing at for my spring semester field study. Coming from one of the warmest and most nurturing people I have ever known, I knew she meant it. I am currently a junior at Hampshire College in Amherst, MA (or a Division II student in Hampshire vocabulary), studying arts integration and specializing in theatre as a teaching tool. As a young person who struggled with the traditional educational system, I found myself through the arts. I am passionate about using the arts to teach and learn, experiencing first hand how the arts can change lives. I stumbled upon Creative Arts Team while researching field study opportunities. I knew I wanted to be in New York City and have hands-on experience working with young people doing theatre. I reached out to many organizations and, by some amazing stroke of luck, found myself at CAT. Here at CAT I mainly work with the Adolescent Literacy Program (ALP). I work five days a week. I am either in the office assisting on projects, or in Brooklyn with Actor Teacher Katherine Chua, supporting her and the students’ work in every way I possibly can. I don’t know if I have ever worked with a group of youth as open and welcoming as the ALP students are. The idea of joining a community halfway through the year was a bit intimidating, but it was a challenge that I was obviously more than thrilled to take on. I received a few goodbye hugs at the end of the first day, and I left knowing that all I had to do was be the best self I could be, and that would be enough. The openness displayed by the young people powerfully attests to the positivity and beautiful mentorship of the actor teachers (Kat, Andre, and Brisa). If I have learned one thing from my two months at CAT and working with ADL, it’s that this work is HARD. During one of my conversations with Kat she told me, “Despite the long hours I work, I have never felt so rewarded.” This work is exhausting. It’s about being on your feet for many hours and opening up your heart. It’s about the process. And it’s about allowing these young people to realize and practice all of their amazing abilities. Ultimately the work is all about giving. And I can’t thank Creative Arts Team and the ALP team enough for giving me this incredible opportunity to join them in doing their beautiful work. I’ve been participating in the NYC Student Shakespeare Festival since 2004, and I look forward to this phenomenal program every year! My students feel the same way – they can’t wait until our school’s drama club is offered, so we can delve into Shakespeare’s plays and make them our own. Info Tech’s 2014 scene: Inner angels & demons get involved with a murderous plot, taken from a mixture of Julius Caesar, Macbeth & Othello. 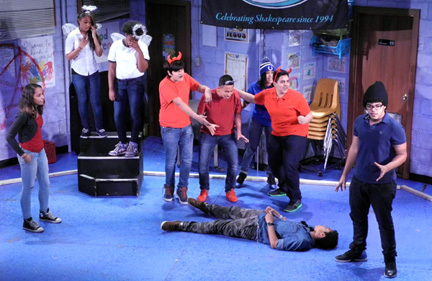 Once our drama club is formed in January, we begin by engaging in theater activities – much of what I learned in the professional development days provided by CAT. Then we explore genres and themes that pique my students’ interests, ranging from murder mystery, teenage love, betrayal and parent-child relationships. My students are given opportunity to take ownership – from choosing the central question which will guide the Shakespearean piece, to adding their own interpretations of characters, to choosing costumes and stage directions. They also love having professional teaching artists from CAT come to our school and guide them in developing their theatrical skills and preparing them for the big showcase at an off-Broadway theater, the esteemed Lucille Lortel Theater. 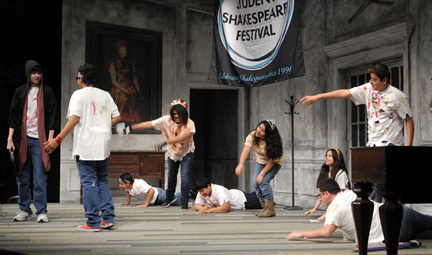 Info Tech’s 2013 scene: A Zombie Hamlet! 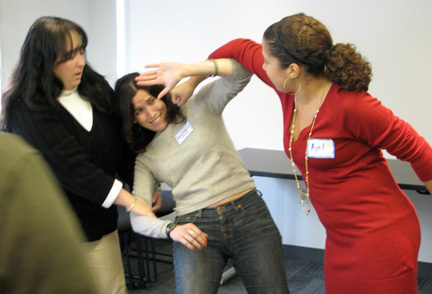 Heather Conn (center) at an NYCSSF professional development workshop in 2008. Note from CAT: Heather Conn is not an employee of CAT, but an annual participant in our NYC Student Shakespeare Festival – we are grateful for her (and her students’) kind words here as well as her fabulous Festival participation!